1st floor of an old traditional building, quiet street, main room with sideboard, table, benches and armchairs, sofa bed, coffee table, television. Free wifi access. Open kitchen electric hotplate, micro wave and fridge. Bedroom with queen size, bedsides tables, desk and chair bathroom with bath, wc, sink and washing machine. Flatiron, ironing board, hoover, rotary clothes line. Also supplied bathrobes, slippers and all the cleaners. Over fifty, I enjoy travelling and meeting different people and culture. I am keen on history , architecture, sports but also food and wine. This is why I left Brussels to settle in Provence twenty years ago. I love to share this fascinating city with people. Bath, WC, sink and washing machine. Excellent location, quiet, very clean, complete kitchen, washing machine, and town information provided. Rental in an old neighborhood giving it a true feel of Avignon. Enjoyed stay and Highly recommend. Great apartment in the heart of the city. Close to everything! Philippe was awesome! The apartment is well furnished and the bed is very comfortable. We stayed for two weeks and were able to take several day trips as Avignon is very central to exploring Provence. Our landlord Philippe picked us up from the train station to take us to the apartment which was much appreciated as it was raining. He also offered to take us to our cruise ship upon our departure, but we had other arrangements. Philippe provided suggestions for great restaurants in the area. We are foodies and we loved all of his recommendations. He also helped us find English speaking stations on the TV. We like to submerse ourselves in the culture of our surroundings, so we enjoyed the cafe, restaurants, and people right around the corner. The only thing missing was a view, but that didn’t really matter as we were out and about every day! We loved Avignon and hope to return someday! We highly recommend this apartment! It was a great pleasure to meet and welcome Jan and Ron !! Glad to see you enjoyed so much the apartment as well as the city and its surroundings. Sharing time and my passion for Avignon with my guest is part of making their stay as memorable as possible. Culture, gastronomy, way of life...this what it is all about. The apartment is on the second floor on a very quiet Street, near restaurants, grocery, shopping, bakery, etc. It is also close to a bus stop which runs to a free parking lot if you have a car . Most Avignon attractions or within walking distance . Philippe provided suggestions for day trips which proved to be quite enjoyable. This was our first VRBO experience, and was overall quite positive. 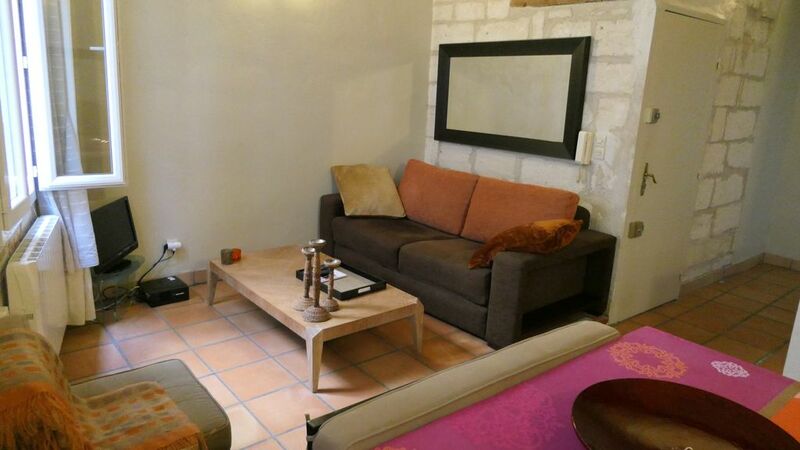 My wife and I rented this lovely 1 bedroom apartment a very short walking distance from the Palais des Papes. It is exactly as pictured in the photographs. Avignon is a wonderful and picturesque little city that is the perfect home base for traveling throughout southwestern France. Philippe, the owner, is mentioned many times in all of the reviews of this apartment and the glowing words are all true. He picked us up and delivered us back to the train station at the beginning and end of our stay. When we arrived, after dropping our bags at the apartment, he took us on a walking tour of the neighborhood and made sure we knew where we could buy groceries, get coffee, etc. He also gave us several excellent restaurant recommendations. In short, he couldn't have been nicer or more gracious. We had a great time in Avignon and all of Provence and I heartily recommend this apartment to anyone visiting the area. The apartment in the old part of Avignon was near to all popular tourist attractions. All necessary shops were nearby. The apartment was well equipped with everything you could need. Phillipe was kind enough to pick us up and return us to the station. He took us around the local area showing us all of interest, we appreciated it very much. I recommend it. The apartment was excellent - very comfortable beds and well equipped. We especially liked the area around it - off the tourist track, around the corner from a lovely square with good restaurants and a flea market on Sunday morning. The street was quiet and we could walk everywhere. It is also very close to a free parkng area just outside the city walls. Our host, Philippe was great - he picked us up from the TGV station and gave us lots of information and showed us around. We would highly recommend this place. Five minutes walking from the Pope Palace, 10 mn from the famous 'Pont d'Avignon', museums and gothic churches. Free parking lot located just outside the city walls, offering a free shuttle service with a bus stop only 200 meters from the apartment.